M Subramaniam, P Hussin. Medial Epicondyle Fracture With Associated Elbow Dislocation In An Adolescent. The Internet Journal of Orthopedic Surgery. 2007 Volume 9 Number 2. Injuries to the medial aspect of the distal humerus in young children can range from an avulsion fracture of the medial epicondyle to a much more serious Salter-Harris type IV fracture of the medial condyle, which crosses the physeal plate. The distinction between these types of fractures is key to the selection of appropriate treatment. 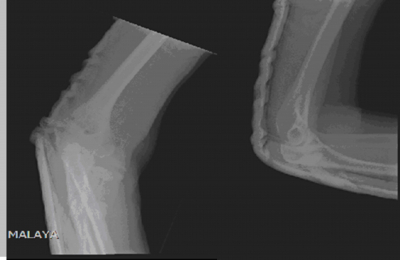 This diagnosis may be difficult to ascertain due to the limitations of radiographic visualization of cartilaginous fractures observed with the developing anatomy in this area. Inadequate reduction of the physeal growth plate and the joint surface cartilage in a medial condyle fracture can lead to serious complications. This is a case of a 16 year old adolescent boy who had a fall at home. The boy was apparently standing up on a stool trying to change bulb when the stool moved and he fell down. He claims had a fall with his right upper limb outstretched while trying to block the fall and as he hit the floor, his elbow was put in valgus stress. Immediately after the fall he was not able to move his right elbow anymore and associated with swelling, severe pain and deformity. He has no significant past medical or surgical history. Examination revealed a swollen right elbow kept in flexion. Severe tenderness was noted on palpation over the medial epicondyle and clinically the elbow was dislocated posteriorly. There were no neurovascular deficits. Daily neurovascular assessment was done and showed no deficits. Open reduction of the fracture site with cannulated screw fixation and K wiring of the medial epicondyle of right elbow was done on the 30/8/07.The K wire was buried under the skin. His elbow was protected with above elbow back slab post operatively and he was later discharged from the ward on the post operative day 2. He was seen back in clinic on the 20/9/2007 (3 weeks post operatively). Check X-ray was done and showed a well reduced fracture with minimal callus formation. The K wire was noted to be piercing out of the skin and it was removed. However there were no signs of wound infection. The back slab was removed and he was started on physiotherapy for elbow range of motion. He was seen again in clinic 4 months later with full range of movement of his right elbow. X ray showed united fracture. The age of the patient, the extent of initial injury and displacement, and the delay in initial treatment play important roles in the clinical outcome. For medial epicondylar fractures, nonoperative management of fractures displaced up to 15 mm does not appear to be associated with functional deficit unless entrapment of the epicondylar fragment in the joint is present. Entrapment of the epicondylar fragment in the joint can block motion and the fragment should be reduced.Closed reduction and cast immobilization is adequate for undisplaced , minimally displaced, or even displaced up to 15 mm fractures of medial epicondyle. In many studies, including more recent long-term follow-up reports, patients treated nonsurgically had results similar to those of patients treated surgically, even for fracture fragments displaced as much as 15 mm. A radiographic nonunion of the medial epicondylar fracture fragment associated with nonsurgical treatment was not found to have any functional impairment in at least one long-term study. The only absolute indications for operative management of closed medial epicondylar fractures are the incarceration of the medial epicondylar fragment within the joint and an open fracture. An incarcerated fragment within the joint must be removed. Several closed means of reduction can be used, and the success rate with these methods approaches 40%. One such maneuver (Roberts manipulative technique) is performed under sedation and involves placing a valgus stress on the elbow while supinating the forearm and simultaneously dorsiflexing the wrist and fingers to place the forearm flexor muscles on stretch. If employed, this maneuver is usually performed in the operating room with the patient under general anesthesia. Joint distention techniques also have been described to help facilitate the closed reduction of the incarcerated medial epicondyle fracture. 1. Wheeless' Textbook of Orthopaedics http:// www. wheeless online.com / ortho /complex_elbow_dislocations. 2. Rockwood CA, Jr, Beaty JH, Wilkins KE. Fractures in children, 4th edition. Lippincot Raven Philadelphia-New York. 3: 844.